A TUNE-UP game between Rain or Shine and NLEX was stopped on Friday after former college rivals Ryan Arana and Enrico Villanueva once again figured in heated brawl at the Meralco Gym in Ortigas. Witness claimed the scuffle broke out near the first quarter after Arana attempted a coast-to-coast layup on a fastbreak and was met hard in the air by the bull-strong Villanueva. “Pisikal ang laro eh. Tapos less than twenty seconds in the first quarter, nag fastbreak si Ryan pero bagsak siya sa depensa ni Rico,” said a Rain or Shine official who witnessed the incident but refused to be named. “Actually sabi ni Ryan, paangat pa lang daw siya, naka-abang na yung siko ni Rico. Kaya siya naman, nag-umang rin ng siko… Sabay silang bumagsak. “Pagbagsak nila sa sahig, para silang mga manok na panabong. Antimano, nagkana agad,” said the official. Another source told Spin.ph Arana later threw the ball hard at former Ateneo star Villanueva, who retailed by punching the Rain or Shine in the face. "Sumapak din si Arana," said the source. Arana, a former La Salle Green Archer, suffered a bloodied nose while Villanueva ended up with a bruise on his eyebrows, another source claimed. Both players also suffered minor bruises before they were separated by players from both sides. A PBA referee was also accidentally kicked during the commotion, a source said. “Nagkatakbuhan agad ang bench ng dalawnag team para umawat. Pero yung referee, mukhang natamaan rin ng sipa nung nagbubuno yung dalawa,” said a source from NLEX who named the game official as referee Emy Tankion. Bad blood between Arana and Villanueva is no longer new to basketball fans as the two were part of the brawl that marred one of the La Salle-Ateneo games back in the early 2000. Officials from both teams decided to just cancel the scrimmage with still a few seconds remaining in the first quarter and Rain or Shine leading, 23-20. However, Villanueva, a source said, was the first to offer a truce after he approached Rain or Shine coach Yeng Guiao, who was his former mentor at Red Bull. Guiao then immediately called Arana so the two can settle their differences. “Nagkasundo rin agad yung dalawa. 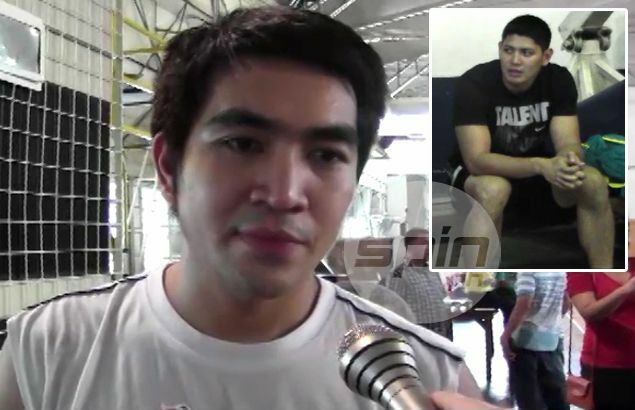 Lumapit kasi si Rico kay Coach Yeng tapos agad na tinawag ni coach si Ryan,” said the Rain or Shine official. That is not expected to end there, however, as the two face penalties from the PBA since the fistfight happened in a sanctioned tune-up game. The fight was also reportedly caught on video by PBA referees supervisor Boy Cruz. PBA commissioner Chito Salud is expected to summon the two players. The league is also set to investigate if other players threw punches during the brawl.